BriskHeat Grounded Heavy Insulated Heating Tapes (BIH-G) provide a Grounded high-temperature fiberglass heating tape solution; with maximum exposure temperatures up to 482°F (250°C). 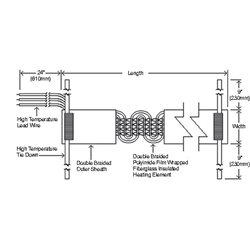 The Multi-stranded grounded resistance wire heating element provides exceptional flexibility and durability for your high temp heating tape solution needs. Fiberglass outer sheath provides electrical insulation for safe use with electrically conductive surfaces. Polyimide wrapped heating element provides increased dielectric insulation for added safety. Available in a variety of length configurations. † 1.75” (44mm) wide tape or greater only.